I have some great suggestions for Retirement Gifts ! Ideas that honor the retiree, and which are unique and hold special meaning for him/her. I can be difficult to choose appropriate retirement presents for men or women. Gifts that show the right level of consideration, are useful and thoughtful - maybe humorous - and will be a cherished long lasting memory of a happy and successful career. The reason I know that my listed retirement souvenirs will be appreciated is that they are the gifts I received upon my retirement! My work was a place where I grew personally and professionally. I valued the esteem and friendship of both work colleagues and external business associates. The retirement gifts I received from the company, my work colleagues and business associates were an important part of the celebration of my retirement. And they give me some insights into how I am viewed by others! Perhaps these are retirement gifts for men - but I appreciated how thoughtful they were in terms of recognizing my hobbies and interests, and my new life stage. I got the watch from the Sales staff. They were at the heart of the company’s success story and they supported me personally and in my role as Marketing Director and Key Accounts negotiator. I was delighted to be recognised by them in this way. It concluded with a photo gallery of my work friends and colleagues, with much appreciated retirement sentiments. Retirees are very sensitive, and appreciative of, everything that is said or written about them when they are retiring! I got a beautiful model CIE “N” Class Locomotive from the creative genius of the ad agency. Every boy loves a train! But it was also an acknowledgment of my modest contribution to a classic Christmas advert called “Train”. 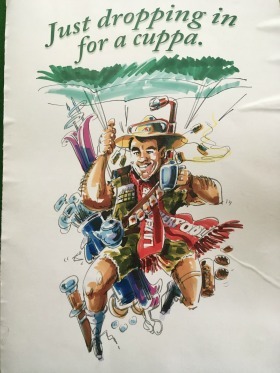 The retirement sentiments in the accompanying card made an apt reference to Managing the Transition to Retirement. This was a novel and welcome retirement gift. An increasing awareness of the spiritual dimension of one’s life, however that might be expressed, is a feature of later life stages. “We had a few bob left over after we bought the books Greg”. I know whose idea this was, and I still can’t take money off him on the golf course, even with the best putter in the world! A framed copy of page one of the Cork Examiner, dated the 26th of January 1947, my birthday. One of the headlines that caught my attention was “Artic Weather Hits Ireland.” My mother often told me the story of “The Big Snow”, which lasted well into spring and made life very difficult for man and beast. The price of the newspaper was three halfpence, and France was “In the grip of inflation!” Plus ca change, plus c’est la meme chose. No apology needed for this work of art from the advertising agency, I loved it! It depicts me parachuting (Lets Go)-“Just dropping in for a cuppa,” and reflects several of my hobbies and sporting interests. It is in the form of a giant greeting card and contains some very warm and creative retirement sentiments, from colleagues in the world of advertising, PR and research. A specially commissioned gift from the company’s Banker, acknowledging my role as Finance Director. A sterling silver plate, recessed in a piece of West Cork slate, engraved with the Willow Pattern, synonymous with the Tea Trade. The art of hand engraving is rooted in the chisel-like gravers, unchanged for three millennia. A truly unique gift. “A good book is the best of friends.” I love collecting books-I’m a platinum member of Amazon.com!-and someday I’ll get around to reading them! I was delighted to receive some books from people who must have read My Bucket List. “Good Vibrations”-coast to coast by Harley (No.7 on my list) and “Hotel California”-California Dreaming, Laurel Canyon and the West Coast music (No. 9 on my list). A gift from the “Mad Men”. Parasol and Picnic Table, by Colin Martin. Two scenes that depict my break from the 9-5 job and the opportunity for more leisure. Cards, bottle of wine, chocolates, cake-everything counts and was enjoyed and appreciated. Related to Hobby - gardening, fishing, Gym membership for active retirement, cooking class, golf clubs or lessons, reading, Music. Plant a tree - This was done for me in Rwanda. When I review my list I am humbled and grateful that my work colleagues and business associates honored my service and friendship in this way. Some of the gifts were unique and personal; some were luxury, others functional. All of them are long lasting memories of a happy and fulfilling career.